Well, for the third Lyric of the Day installment in a row, the theme that grabbed me is Love. The source of today’s lyric, Rise To Me, from The Decemberists‘ most recent album, The King Is Dead, is just about the most beautiful song I’ve heard in a long, long time. From a musical perspective alone, the song has a lovely, simple chord progression and verse-chorus-verse-chorus-etc. composition; and the arrangement, rooted in acoustic guitar, piano, harmonica, Chris Funk‘s gorgeous, pining pedal steel guitar, and Gillian Welch‘s perfectly placed harmony vocals, provides a lush canvass for Colin Meloy‘s characteristically poetic lyrics. So, let’s dig into those lyrics and see what’s going on here. I think you’ll agree that Rise To Me is a very powerful expression of love. In this first verse, Meloy sets up an image of a maternal natural world that lovingly sustains us. And while the mountain is big and the river wide, the first chorus that follows speaks of challenges and threats. The photo I’ve included above seemed to capture something of nature’s stubborn determination to stand fast in the face of challenges. 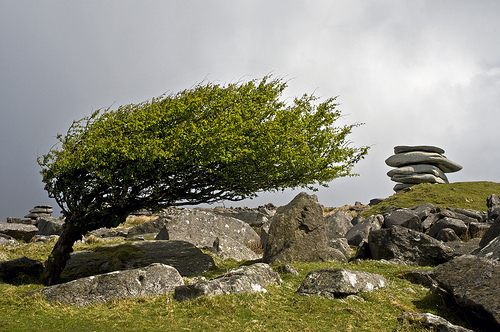 While the tree may have been shaped by the wind and receding glaciers may have moved those boulders around tens of thousands of years ago, the boulders now seem unmovable, the tree still stands, green with life, and the green grass, too, seems to have decided that it will stick around as well. With this image of steadfastness established, Meloy turns to the subject of his son Henry, who has high-functioning autism. As a father of a son myself, this is the part of the song that first caught my attention. There may be nothing more painful, emotionally, than to witness your child suffer, and so it’s only natural that a parent, out of pure, primal love, might desire that their child learn from the example set by the unyielding force of nature in the first verse, so that he may be as prepared as possible for the many challenges that life will bring. Finally, Meloy adresses his wife, wishing for her the same kind of strength and resiliency. And I can’t help speculating that there’s recognition here too that the strain of raising a child with autism can lead to strain in their marriage, and that on top of all the usual challenges most couples face, there’s hope that their relationship can stand firm. Anyway, enough analysis. Here’s the band, sans Gillian Welch unfortunately, performing Rise To Me live. ‹ PreviousNicaragua? Yeah, I could go there! That is beautiful. I love the word “sway” used in lyrics. It really is a beautiful song, and if there’s a songwriter working today for whom it makes perfect sense to have used the phrase I am in your sway, it’s Colin Meloy. Thanks for the comment and for visiting Fish & Bicycles!